Besides photos, now we tend to share lot of video content online. Privacy concerns always remain for any uploaded media including images and videos. You can explore following alternatives to upload and share videos privately. It allows strict sharing controls, as a result only genuine users can access and watch video content uploaded by you. Majority of users have the perception, every video upload on Youtube is available for public viewing. On the contrary, Youtube has strict private sharing features allowing you to share any uploaded video privately with specific group of Youtube users. You can also share vidoes using unlisted feature, where only users with access to unique video URL can view it. If you have setup robust Facebook privacy controls, then you can easily share videos in private with specific group of Facebook friends. The uploaded video on your Facebook profile is only posted on your “Wall”. Hence, only your Facebook friends have access to video posted on the wall – resulting into private video sharing routine. 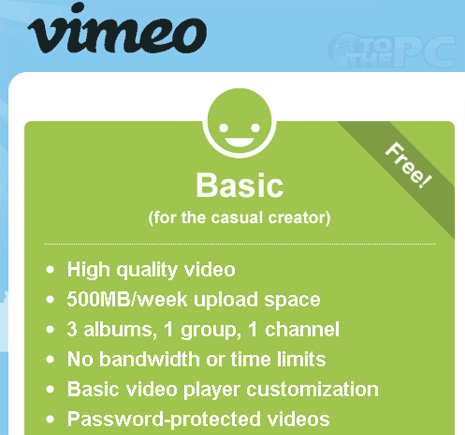 Vimeo is a handy free online videos hosting service. You can share videos privately by adding password to uploaded videos. Only users with video URL and correct password can view it. Free Vimeo account should be enough for majority of users with 500MB per week upload space, no bandwidth restriction and ability to password protected uploaded clips.